Established in 1993, KI Outdoor Action began by offering horse trail rides, sail boarding and snorkelling. Over time the business evolved to meet the needs of a changing market and in 2007 Brenton Davis bought the business and transferred the operations to the current premises on Jetty Road at Vivonne Bay. We offer a variety of high quality, action based, outdoor experiences. Activities available now include kayaking the Harriet River, guided quad tours, and sandboarding the massive dunes of Little Sahara. Combining the opportunity to learn about the environment and observe kangaroos and other wildlife in their native surroundings with the ability to explore otherwise inaccessible parts of Kangaroo Island, our aim is to make everyone’s trip to Kangaroo Island the holiday of a lifetime. With a focus on customer service and professionalism, we have invested in the latest equipment and regularly exceed customer expectations. We regularly use and recommend the services of Aldinga Mowers and Cycles, Coast Yamaha, Sandgroper Boards, Adelaide Canoe Works and Ingrams Home Hardware. In 2014 we expanded our business and relocated our main office to Little Sahara. This is part of our long term plan to offer better services to visitors, and manage the impact of visitation to the dunes of Little Sahara. In June 2015 the construction of the visitor centre was completed. Designed my Max Pritchard, the building blends into the landscape and recently won two awards at the the South Australian Master Builders awards. 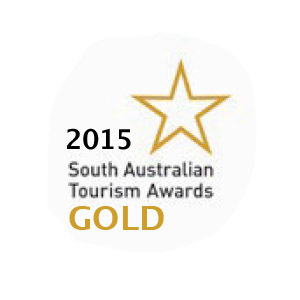 We are an accredited tourism business, and were awarded a silver medal at the 2012 South Australian Tourism Awards, gold medals in 2013 and 2014, and in 2014 were the winner of the Adventure Tourism Category. As an Advanced EcoTourism business preserving our environment is important to us and we have worked with Greening Australia and Canopy to offset our carbon emissions, and are now 100% carbon neutral. In 2009 Kangaroo Island Outdoor Action provided equipment and support for the documentary filmed on Kangaroo Island to raise funds for children with special needs through the charity “Kick in for Kids”. This was screened on Channel 9 on Sunday January 10th 2010, and was screened again later on in the year. In 2012 we helped raise money for the Womens and Childrens Hospital Foundation. As a major sponsor of the Coast to Coast for Kids Land & Sea Challenge event on Kangaroo Island, we provided equipment and support to help with the filming of their documentary. Screening of the documentary will be on Chanel 7 during 2013. Funds raised during this event exceeded $100000. In 2013 and 2014 we supported the Flinders Medical Centre Foundation, by donating experiences for corporate team building. At the Pink Yellow Blue Ball charity auction our donations have raised over $5000 each year for cancer research. We look forward to continuing to be part of this fantastic event in 2015. Kangaroo Island Outdoor Action has also featured on several television programs including Postcards, Getaway, Sunrise, Discover, Ireland AM and more. To preview some of these programs click on the links below.